From the outside, it's just another big, shiny stainless-steel pipe bent at a 90° angle. But take off the shipping caps at one end or the other, have a peek inside, and you will see a technological marvel. The ITER feeder and instrumentation team members responsible for the design and manufacturing of the cryogenic feedthrough for poloidal field coil #4. A cryostat feedthrough is part of the feeder system that accommodates and relays all the essential "services" for the operation of a superconducting magnet. Connected to a coil terminal box at one end and crossing into the cryostat at the other, it carries the superconducting busbars for the electrical current, the piping for the cryogenic fluids, and the cables for the diagnostics signals—all carefully insulated by an actively-cooled thermal shield and a vacuum duct. 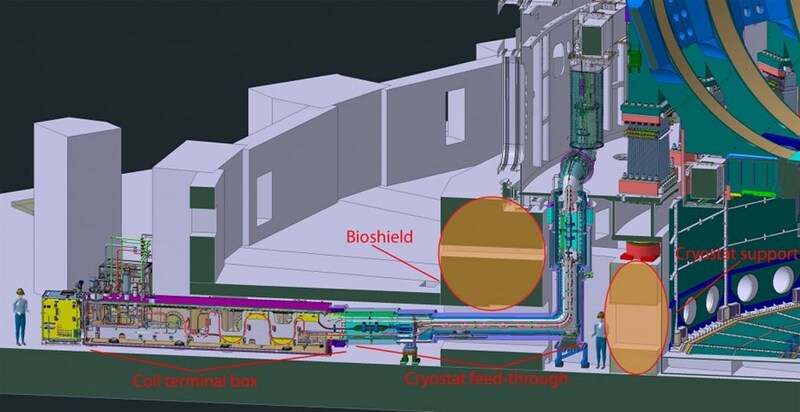 Last week, the first of the 31 cryostat feedthroughs that must be delivered to the ITER construction site stood in the hall of the Magnet Infrastructure Facilities for ITER (MIFI), a workshop operated by a joint team from ITER and the French Alternative Energies and Atomic Energy Commission (CEA) to develop and qualify the ITER magnet elements and their assembly procedures. 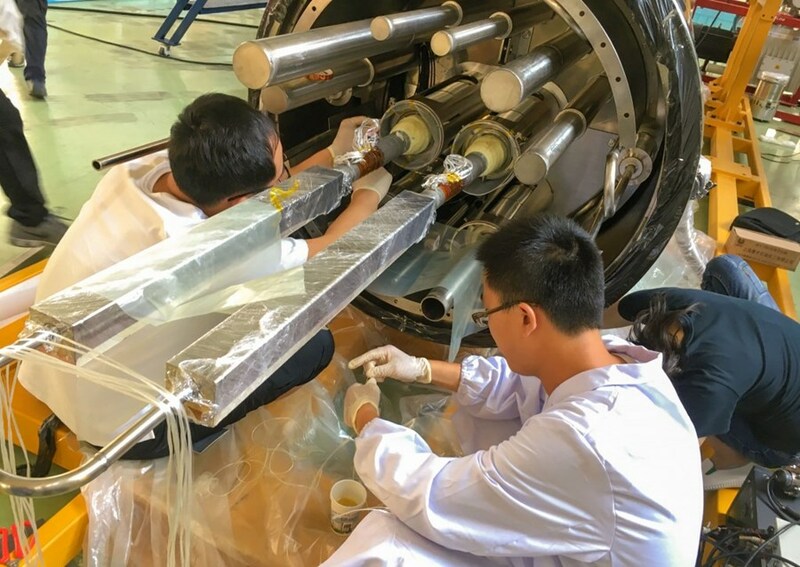 Designed by the ITER feeder team, procured by the Chinese Domestic Agency, and manufactured at the Institute of Plasma Physics ASIPP in Hefei under the feeder team's supervision, the cryostat feedthrough is the first magnet component required on site because it needs to be brought into position before the completion of the cryostat base support ring. At MIFI, the cryostat feedthrough will be subjected to high-voltage tests, leak tests and endoscopic inspections before being installed into the Tokamak assembly arena and later connected to poloidal field coil #4, one of the two largest of the machine's six poloidal field coils (24 metres in diameter). 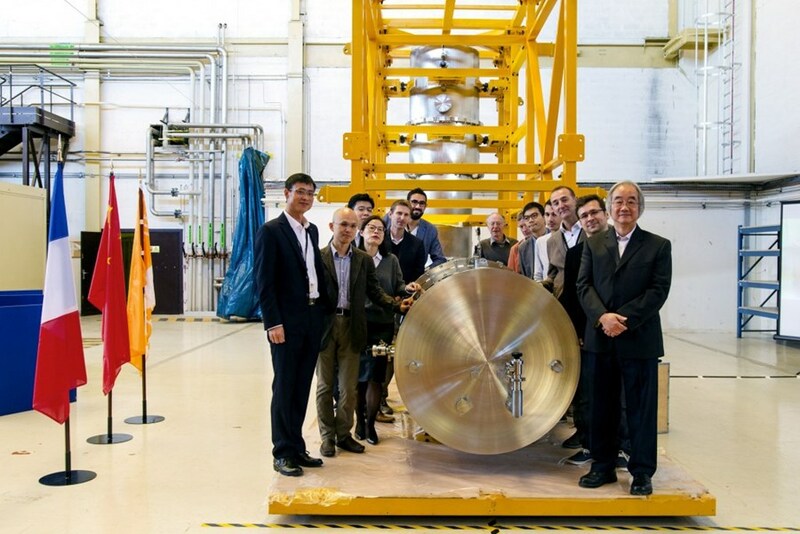 To celebrate this highly symbolic event, representatives from CEA's Research Institute for Magnetic Fusion (IRFM), MIFI and the Chinese Domestic Agency joined ITER management and staff from the Magnets Division inside the MIFI hall, in the presence of the massive component. "The arrival of this component is in itself a cause for celebration," said ITER Director-General Bernard Bigot. "It is the very first in a long line of magnet system elements for the most complex, most challenging electromagnetic device ever designed—the ITER Tokamak." For Luo Dulong, head of ITER China, the moment—ten years, almost to the day, after the official establishment of the ITER Organization—will be "recognized as historical." "MIFI is the most visible element of our cooperation with ITER in the field of superconducting magnets, and this component is the most spectacular among those that will be tested in this workshop," said Alain Bécoulet, the head of IRFM. "But it is only a beginning. As more magnet components are delivered to ITER in the coming weeks and months our collaboration with increase and expand." The cryostat feedthrough is a ''captive'' component that needs to be brought into position before the completion of the cryostat base support ring. "We began working on feeders with ASIPP 12 years ago," reflected Neil Mitchell, head of the ITER Magnet Division. "It is hugely motivating for the different teams to see the arguments, discussions, tests and prototypes finally condense into the real component that is standing here today." The long adventure is drawing to its successful conclusion—an indication that, in Luo Dulong's words, "ITER is in very good shape." And so is fusion research as a whole: a few steps from MIFI, in a crowded and intensely silent control room, operators were monitoring plasmas shots in the Tore Supra tokamak, now refurbished into WEST and operating as a test platform for ITER. Watch a short video of the arrival here.